PerfeCTa SYBR Green FastMix is intended for molecular biology applications. This product is not intended for the diagnosis, prevention or treatment of a disease. PerfeCTa SYBR Green FastMix is a 2X concentrated, ready-to-use reaction cocktail that contains all components, except primers and DNA template. This rigorously optimized master mix contains of proprietary buffer technology, stabilizers and AccuFast Taq DNA polymerase to deliver maximum assay precision, sensitivity, and PCR efficiency for accelerated or conventional thermal cycling conditions for SYBR Green detection. Dye-based detection methods are critically dependent on highly specific amplification because dsDNA dyes will bind to any amplicon, including off-target primer elongation and primer dimerization. AccuFast hot start Taq DNA polymerase contains a proprietary mixture of ultra-pure monoclonal antibodies that stringently suppress primer elongation prior to the initial PCR denaturation step and allows for setup and multi-day storage at ambient room temperature prior to thermal cycling. AccuFast provides rapid release of fully active enzyme to support accelerated thermal cycling conditions. 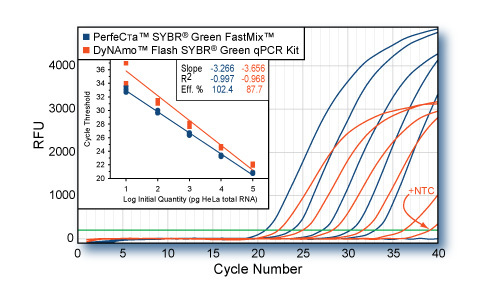 RNA-specific adenosine deaminase (ADAR) was amplified from log-fold dilutions of total HeLa cell cDNA (100 ng to 1 pg) using PerfeCTa&trade; SYBR Green FastMix or the SYBR GreenER qPCR SuperMix (Invitrogen) according to each manufacturers protocol. Averaged plots for quadruplicate reactions for each input quantity are shown. Replicate CT values are shown on the standard curve (Panel A, inset). Cycling conditions: Invitrogenn: 95&deg;C, 10 min followed by 40 cycles of 95&deg;C, 10s; 60&deg;C, 60s; PerfeCTa&trade; SYBR Green FastMix: 95&deg;C, 20s followed by 40 cycles of 95&deg;C, 1s; 60&deg;C, 20s. PerfeCTa SYBR Green FastMix amplified the ADAR gene with higher efficiency and greater sensitivity. All replicate reactions for SYBR GreenER qPCR SuperMix failed to amplify ADAR from 1 pg of cDNA. Reaction buffer with optimized concentrations of molecular-grade MgCl2, dATP, dCTP, dGTP, and dTTP. Proprietary enzyme stabilizers and performance-enhancing additives. Store components in a constant temperature freezer at -25°C to -15°C protected from light upon receipt. After thawing, mix thoroughly before using. For lot specific expiry date, refer to package label, Certificate of Analysis or Product Specification Form. The mouse strain SKH1 is widely used in skin research due to its hairless phenotype and intact immune system. Due to the complex nature of aryl hydrocarbon receptor (AHR) function in the skin, the development of additional in vivo models is necessary to study its role in cutaneous homeostasis and pathology. Variants of the Ah allele, exist among different mouse strains. The Ahb−1 and Ahd alleles express high and low affinity ligand binding forms of the AHR, respectively. The outbred SKH1 mice express the Ahb−2 and/or Ahd alleles. SKH1 mice were crossed with C57BL/6J mice, which harbor the Ahb−1 allele, to create useful models for studying endogenous AHR function. SKH1 mice were bred to be homozygous for either the Ahb−1 or Ahd allele to establish strains for use in comparative studies of the effects of differential ligand-mediated activation through gene expression changes upon UVB exposure. Ahb−1 or Ahd allelic status was confirmed by DNA sequence analysis. We tested the hypothesis that SKH1-Ahb−1 mice would display enhanced inflammatory signaling upon UVB exposure compared to SKH1-Ahd mice. Differential basal AHR activation between the strains was determined by assessing Cyp1a1 expression levels in the small intestine, liver, and skin of the SKH1-Ahb−1 mice compared to SKH1-Ahd mice. To determine whether SKH1-Ahb−1 mice are more prone to a pro-inflammatory phenotype in response to UVB, gene expression of inflammatory mediators was analyzed. SKH1-Ahb−1 mice expressed enhanced gene expression of the chemotactic factors Cxcl5, Cxcl1, and Ccl20, as well as the inflammatory signaling factors S100a9 and Ptgs2, compared to SKH1-Ahd mice in skin. These data supports a role for AHR activation and enhanced inflammatory signaling in skin. The uptake of Cd and some biomarkers of exposure and effects have been investigated in specimens of land snail Cornu aspersum exposed to vaporized CdCl2 (10mg/L) for 7 days. The Cd levels quantified in snail's whole bodies confirmed Cd bioavailability trough vaporization and an higher accumulation in the midgut gland compared to the foot. Biological responses investigated showed a reduction of destabilization time of lysosomal membranes (NRRT) in hemocytes and an induction of catalase activities (CAT) in midgut gland. A further evidence of CdCl2 vaporized exposure was given by an increase in MT protein content as well as induction of Cd-MT gene expression, highlighting the central role of the midgut gland in Cd detoxification. These biomarkers can thus be considered as sensitive tools for the assessment of Cd contamination in the air using land snails as bioindicators. No changes in of GST activity and MDA were observed. From the overall results, the land snail, C. aspersum, could be used as good bioindicator of air quality for pollution monitoring purposes having shown clear signs of exposure and effects due Cd exposure by air. Recruitment of a single follicle into the preovulatory hierarchy of the domestic hen ovary occurs from a small cohort of prehierarchal follicles measuring 6-8 mm in diameter. We have previously reported that granulosa cells (GC) collected from prehierarchal follicles express highest levels of membrane-localized follicle-stimulating hormone receptor (FSHR) during follicle development, yet fail to initiate signaling via cAMP following short-term incubation with FSH. Consequently, GC from prehierarchal follicles remain in an undifferentiated state and lack the capacity for steroidogenesis due to a deficiency of cAMP-dependent STAR protein and CYP11A1 gene expression. The present studies investigate FSH responsiveness in GC before and after the transition from undifferentiated to a differentiated state at follicle recruitment. Prior to recruitment focus is directed towards the inhibition of FSHR signaling by β-ARRESTIN (βARR). Specifically, knockdown of βARR mRNA in cultured, undifferentiated GC using small interfering RNA (siRNA) facilitated FSH-induced cAMP formation, STAR expression and progesterone production. Furthermore, over-expression of bovine βARR1 and G PROTEIN-COUPLED RECEPTOR KINASE2 in actively differentiating GC significantly decreased cAMP accumulation and progesterone production following a challenge with FSH. We propose that a βARR-mediated mechanism maintains FSHR unresponsiveness in undifferentiated GC from prehierarchal follicles, and as a result prevents GC differentiation until the time of follicle recruitment. This article is protected by copyright. All rights reserved. Alternative splicing is the process of generating multiple transcripts from a single pre-mRNA used by eukaryotes to regulate gene expression and increase proteomic complexity. Although alternative splicing profiles have been well studied in mammalian species, they have not been well studied in aquatic species, especially after biotic stresses. In the present study, genomic information and RNA-Seq datasets were utilized to characterize alternative splicing profiles and their induced changes after bacterial infection with Edwardsiella ictaluri in channel catfish (Ictalurus punctatus). A total of 27,476 alternative splicing events, derived from 9694 genes, were identified in channel catfish. Exon skipping was the most abundant while mutually exclusive exon was the least abundant type of alternative splicing. Alternative splicing was greatly induced by E. ictaluri infection with 21.9% increase in alternative splicing events. Interestingly, genes involved in RNA binding and RNA splicing themselves were significantly enriched in differentially alternatively spliced genes after infection. Sequence analyses of splice variants of a representative alternatively spliced gene, splicing factor srsf2, revealed that certain spliced transcripts may undergo nonsense-mediated decay (NMD), suggesting functional significance of the induced alternative splicing. Although statistical analysis was not possible with such large datasets, results from quantitative real-time PCR from representative differential alternative splicing events provided general validation of the bacterial infection-induced alternative splicing. This is the first comprehensive study of alternative splicing and its changes in response to bacterial infection in fish species, providing insights into the molecular mechanisms of host responses to biotic stresses. Starches resistant to mammalian digestion are present in foods and pass to the large bowel, where they may be degraded and fermented by the microbiota. Increases in relative abundances of bifidobacteria (blooms) have been reported in rats whose diet was supplemented with Hi-Maize resistant starch. We determined that the bifidobacterial species present in the rat cecum under these circumstances mostly belonged to Bifidobacterium animalis. However, cultures of B. animalis isolated from the rats failed to degrade Hi-Maize starch to any extent. In contrast, Bifidobacterium pseudolongum also detected in the rat microbiota had high starch-degrading ability. Transcriptional comparisons showed increased expression of a type 1 pullulanase, alpha-amylase, and glycogen debranching enzyme by B. pseudolongum when cultured in medium containing Hi-Maize starch. Maltose was released into the culture medium, and B. animalis cultures had shorter doubling times in maltose medium than did B. pseudolongum. Thus, B. pseudolongum, which was present at a consistently low abundance in the microbiota, but which has extensive enzymatic capacity to degrade resistant starch, showed the attributes of a keystone species associated with the bifidobacterial bloom. IMPORTANCE This study addresses the microbiology and function of a natural ecosystem (the rat gut) using DNA-based observations and in vitro experimentation. The microbial community of the large bowel of animals, including humans, has been studied extensively through the use of high-throughput DNA sequencing methods and advanced bioinformatics analysis. These studies reveal the compositions and genetic capacities of microbiotas but not the intricacies of how microbial communities function. Our work, combining DNA sequence analysis and laboratory experiments with cultured strains of bacteria, revealed that the increased abundance of bifidobacteria in the rat gut, induced by feeding indigestible starch, involved a species that cannot itself degrade the starch (Bifidobacterium animalis) but cohabits with a species that can (Bifidobacterium pseudolongum). B. pseudolongum has the characteristics of a keystone species in the community because it had low abundance but high ability to perform a critical function, the hydrolysis of resistant starch. 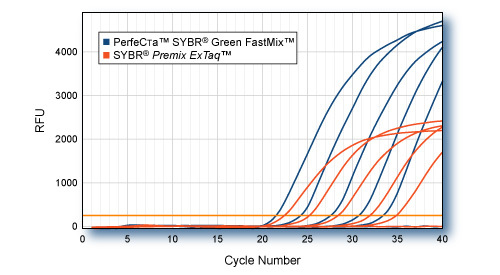 Can I use PerfeCTa® SYBR® Green FastMix® instead of SYBR Green SuperMix? You can use FastMix instead of SuperMix. We have observed similar results with both PCR mixes, however, slightly lower background was observed using SuperMix when using 10 ng of cDNA or more in the qPCR. 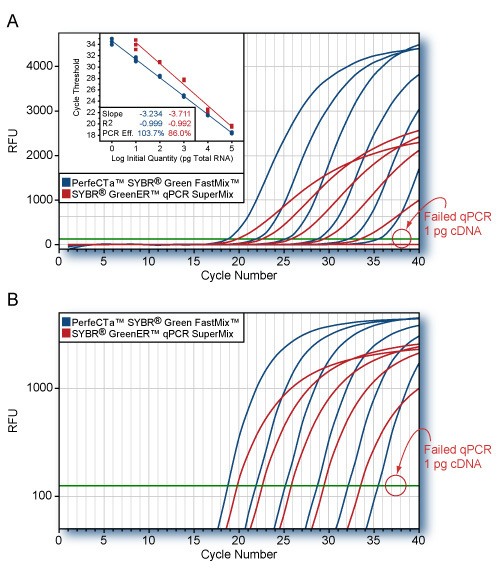 The qScript microRNA Quantification system has been validated using SYBR Green SuperMix. We use Perfecta Sybr Green Fastmix. We are starting to use uMELT software to predict qPCR melt curves. Could you please provide me with this info so that I can accurately use uMELT? [Mono+] : Concentration of monovalent cations in solution (mM). The PerfeCta SYBR Green Fastmix has 50 mM salt and 2.2mM Free Mg at 1X. However, the co-solvents and the concentration of SYBR green I dye in the mastermix also affect amplicon Tm, so you may still not be able to accurately use uMELT. Our R&D has found uMELT mostly useful for predicting multiple melting domains in an amplicon.